Here are five simple ways to turn on a Keyman keyboard. Open an application to type in, like MS Word. You need to have an application open for your Keyman keyboard to load correctly. Select your Keyman keyboard from the list. You will notice the Keyman menu icon change to the icon of your Keyman keyboard. This means your Keyman keyboard is on. Click to open the On Screen Keyboard view of the Keyman Toolbox. Click to select your Keyman keyboard from the toolbar of the Keyman Toolbox. You will notice the Keyman menu icon change to the icon of your Keyman keyboard. This means your Keyman keyboard is on. Press the Language Switcher hotkey to bring up the Language Switcher. If you are using the default Language Switcher hotkey (Left.Alt + Shift) or another hotkey with Alt, you will need to press and HOLD the Alt part of the hotkey and press and RELEASE the last key in the hotkey to use the Language Switcher. When you release Alt, the Language Switcher will close. By default, the Language Switcher hotkey is Left.Alt + Shift. You can view or change the current Language Switcher hotkey from the Hotkeys tab of Keyman Configuration. Navigate the Language Switcher using the arrow keys or by pressing Shift to select your Keyman keyboard. Release the Language Switcher hotkey or press Enter to activate the selected keyboard and close the Language Switcher. You will notice the Keyman menu icon change to the icon of your Keyman keyboard. This means your Keyman keyboard is on. Press and release the hotkey for your Keyman keyboard. You can find the current hotkey for your keyboard in the Keyman menu. You can set or reset a hotkey for your keyboard from the Hotkeys tab of Keyman Configuration. You will notice the Keyman menu icon change to the icon of your Keyman keyboard. This means your Keyman keyboard is on. 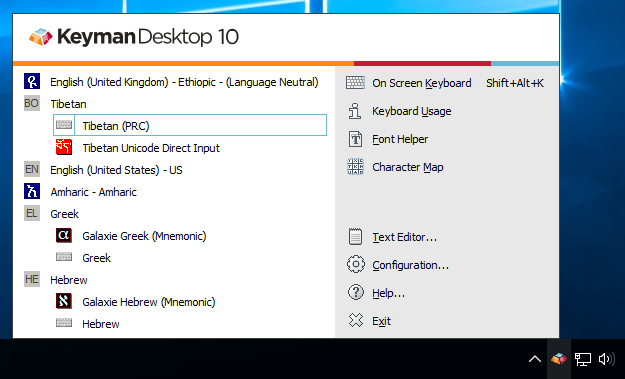 Because Keyman keyboards are always associated with a Windows language, turning on that Windows language will automatically turn on the Keyman keyboard. 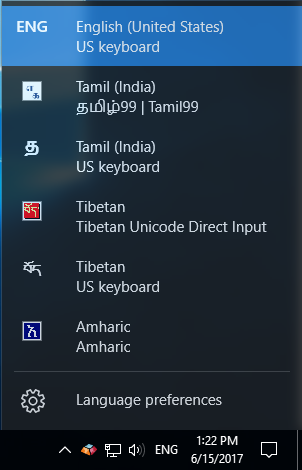 If a Windows keyboard is also associated with the language, or multiple Keyman keyboards are associated with the language, an extra icon will appear next to the Windows language that will allow you to choose the keyboard you want to use.